A sprawling life-after-combat drama, The Best Years Of Our Lives is an engrossing and surprisingly clear-eyed examination of a formidable topic. It's the end of the Second World War, and three servicemen share a plane ride back to their fictional hometown of Boone City. 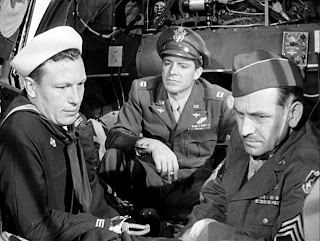 Fred (Dana Andrews) was an airman specializing in dropping bombs; Al (Fredric March) served in the infantry in the Pacific; and Homer (Harold Russell) was in the navy and lost both hands when his aircraft carrier was destroyed by the Japanese, but he has learned to capably use his prosthetic hooks. Homer's family welcome him back but with his disability he feels uneasy, unsure if he is surrounded by love or pity, and he finds it difficult to reconnect with pre-war fiancée Wilma (Cathy O'Donnell), although she is still eager to marry him. Al is surprised by how much his two children have grown, particularly daughter Peggy (Teresa Wright). 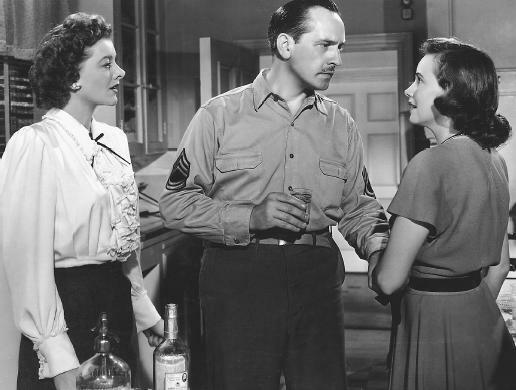 Al's wife Milly (Myrna Loy) tries to help him readjust, and despite an emerging drinking problem, Al is eventually hired as a Vice President at the bank where he used to work before the war, with a mandate to manage loans for returning servicemen. Fred has difficulty finding Marie (Virginia Mayo), the woman he married just before the war, and ends up spending his first evening as a civilian with Al and his family, discovering an instant and shared attraction with Peggy. As the men struggle to re-adapt to their new old lives, Al runs afoul of the bank's bottom-line oriented procedures and his drinking worsens. Fred cannot find a decent job and ends up as a lowly floor salesperson at the local department store, an income that does not satisfy Marie, allowing Fred's relationship with Peggy to deepen. And Homer withdraws from everyone, embarrassed by his disability and unable to imagine what life with Wilma will be like when he cannot even hug her. Samuel Goldwyn recognized the importance of a topic that remains relevant generations later, and commissioned a screenplay. Robert Sherwood eventually adapted MacKinlay Kantor's resulting novella, and the script confronts head-on the difficulties of integration back into civilian life. The Best Years Of Our Lives contains no sugarcoating. It's a movie filled with small awkward moments that ring true, men fighting to find their role in a now foreign environment and having nowhere to turn for help, their women equally ill-prepared and clumsily trying to prop-up their returning heroes. The performances are more stoic than nuanced. Fredric March and Dana Andrews carry most of the load with broad-shouldered resignation and recognition that integration is a battle without a plan. March authentically finds refuge in a bottle and the camaraderie of bar-hopping, quickly forgetting his surroundings and defaulting to the military's definition of relaxation. And once Al is back at his banking job, March effectively conveys the unease of a man used to instinctive decisions having to conform to the discipline of the corporate world. Andrews as Fred represents the other end of the scale, unable despite his best efforts to find any meaningful job to satisfy the rich tastes of his opportunistic wife. Andrews is able to mix a realistic military attitude with an underlying questioning of everything that was once important, Fred's evolving but difficult relationship with Peggy presenting tantalizing opportunities to rediscover happiness in post-war life. Non-actor and real-life Army amputee Harold Russell delivers a most natural performance as Homer, bringing to the role the deep discomfort of a man who just wants to get on with life, but is paralyzed by the acute awareness that the world is watching his every move with pity. The physical nature of his struggle renders Homer the most visible victim of the war, but Russell makes it clear that the bigger battle even for him is the mental discomfort. The ladies provide good support and a refreshingly expansive representation of the home front. 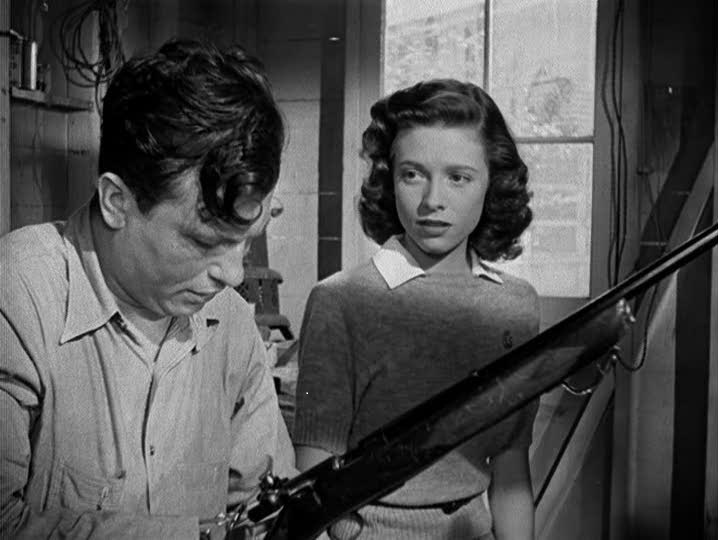 Most interesting is Teresa Wright's Peggy, among the vanguard of young women released into the workforce due to the war, and now equipped with the confidence to chart their own path. Myrna Loy as her mother and Al's wife is the more traditional woman, the wife willing to support, tolerate and help her husband's difficult return. Virginia Mayo as Marie has no patience for integration or anything else. Fred must have had an off-day when he married her just before heading off to war, and now she is only interested in the good life. Peggy offers a much better match, a fact that eventually both Fred and Marie will recognize. Finally Cathy O'Donnell as Wilma offers the innocence of the young woman fully in love with the troubled Homer, but clueless as to how she can help. At almost three hours in length, director William Wyler maintains excellent pacing and interest in the stories of the three men. The film is rich in relevant details, creating realistic surroundings for each of the men, and taking the time to allow the stories to unfold in a relaxed manner. The result is a movie that avoids over-dramatizations and gains strength from a sense of authenticity. Despite ending on the high note of a marriage, The Best Years Of Our Lives purposefully leaves all its stories open ended, with the men aware that there is more work to be done. It's a realistic conclusion for an endeavour that could last a lifetime. 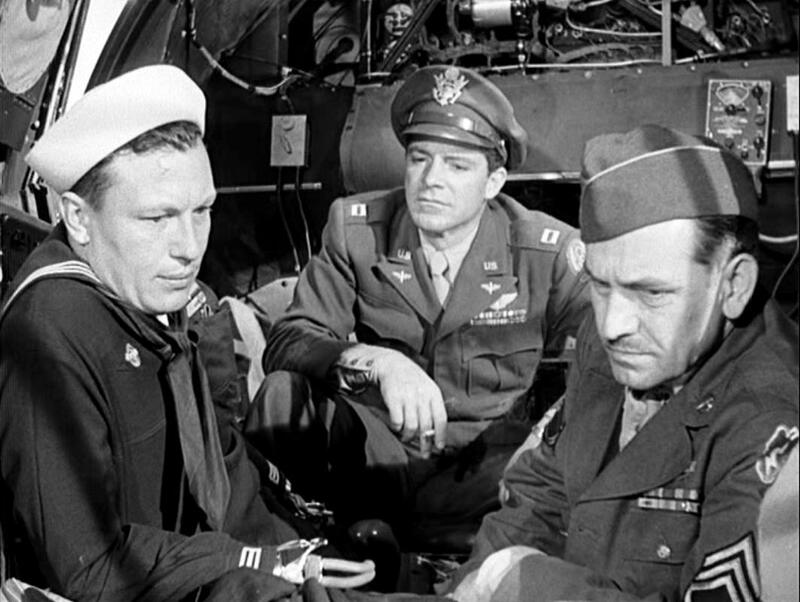 Celebrated with seven Academy Awards, The Best Years Of Our Lives is a film both of its time and ahead of its time, a deglamourization of the battle after the battle, when hard-earned victories can yet yield shattered lives and collateral family damage.